A course of Feldenkrais Awareness Through Movement (ATM) audio lessons. Each can be studied on its own, or you can work your way through the whole collection to learn in-depth how to improve the organization of your hips, shoulders, and torso and improve your functional awareness of their relationships. Through this process, you’ll learn to more comfortably, efficiently, precisely, powerfully, and gracefully project your limbs and your intention into the world. Lessons can be repeated as you wish, so follow your curiosity! If a lesson isn’t comfortable initially, it’s fine to skip it and come back to it later; you don’t have to go through them in this order. When there’s a close link between adjacent lessons, it’s mentioned in the Context tab of the lesson notes. Side-lying, improving functional relationships of the shoulders and hips through small and large movements. Constructing and improving your image of the "quadrilateral" of the torso while integrating the ribs, spine, neck, and head. Later, harnessing the suppleness of the quadrilateral to support reaching and circling the arm. (Prerequisite lesson: Connecting Shoulders and Hips Part 1) Side-lying, further expanding the image of the shoulders and hips toward improving major postural and gait-related organizations of the torso. This lesson uses bending and thrusting the legs from the hips along with lengthening, arcing, and circling the arms. How do we get off the floor? This lesson explores the path from lying on your back to sitting up, and getting back down again, organizing the torso and limbs towards a smoother, simpler, more pleasurable transition. These movements are also powerful organizers for improving upright posture. Back-lying, knees bent, feet standing, often one leg resting out to the side on a pillow. Learning to move the whole self (proximal) in relationship to a quietly resting limb (distal). This reversal of the typical image we have of moving a limb creates a novel learning environment within the self, with benefits for the legs, hips, back, and our overall organization. Sitting on the floor at the beginning and end of the lesson is used to help identify some of the changes that take place. Back-lying, knees bent, feet standing, variations on lifting and lowering the pelvis, and eventually bridging the arms, to improve upright organization and balance. Back-lying, knees bent, feet standing, exploring connections between the joints of the legs, and clarifying their relationship with the abdominal muscles, pelvis, back, breath, and head. Improving leg function by developing some movements into rapid action. Back-lying, knees bent, with a floor-seated frame at the beginning and end. Preparing for and clarifying an important primary relationship in the body: arching the spine while flexing the hips. Back-lying, side-lying, and transitioning into side-lying, refining and harnessing your image of your spine's bias and action as it relates to (and powers) the stepping down of your feet. All toward reorganizing your gait. After you complete the collection, returning to favorite lessons or progressing through from the beginning again will yield new insights. 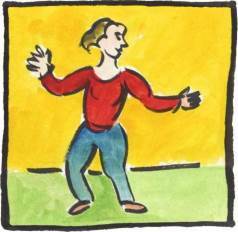 It can be very surprising to new Feldenkrais students how lessons you “know” are a different, valuable experience on subsequent explorations. You might also want to browse our Learning Guides for ideas to help bridge your Feldenkrais learning into everyday life.